Al Premium Food Mart is perfect Chinese supermarket with weekly sales. You can save more thanks to their special promotion each week. Just visit and save your money. Al Premium Food Mart Flyer is greatest way to good shopping. You can buy usual products and if you want you can buy traditional foods from their store as well. Hybrid system would be amazing. You do not have to go somewhere else. As you know Chinese foods are different than ours but you can try their oriental harvest this week. Oranges, lettuces, potatoes, meat varieties, seafood and other products from Chinese looks perfect. We listed the best deals on Al Premium Food Mart just for you and it is time to check them out ! 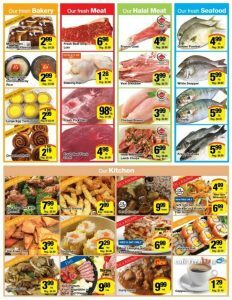 Today’s flyer contains many good items on different sections, so feel free to check them out right now ! You can view the whole flyer with clicking the right hand side image. Our list ends here but today’s deals on Al Premium Food Mart don’t. So do not forget to check out this brand new flyer right now ! Subscribe our news teller for newest flyers, amazing discounts and countless retailers !